As an audio reviewer, one gets used to all sizes and shapes of packages turning up on the doorstep, from tiny boxes containing headphones or USB DACs to the memorable ‘where’s your forklift, mate?’ delivery of a TV a few years back. But I’ve just encountered the first instance of a review product having to be offloaded in the main road just around the corner from my house, and then rolled along my street and onto my drive. The delivery in question was a £5000ish set-up from British company Naim Audio; the problem arose because it happened to be bolted to the better part of 3000kg of 2014 Bentley Flying Spur W12, with which the two manufacturers thought I might like to have a play for a week or so. I was interested because, some ten years after work started on the ‘Naim for Bentley’ project, and having seen its development from a dusty old-school Bentley saloon in a large garage at Naim HQ to an acclaimed installation as popular with customers as it has been with both motoring and technology reviewers, I was keen to hear how the ‘NfB’ system stacked up. After all, we’re now in an age where car manufacturers are taking audio and ‘infotainment’ seriously, and more audio companies are partnering with hi-fi brands to offer audio upgrades: Bang & Olufsen, Bowers and Wilkins, Bose, Dynaudio – even my very midrange Land Rover has a Meridian package fitted. 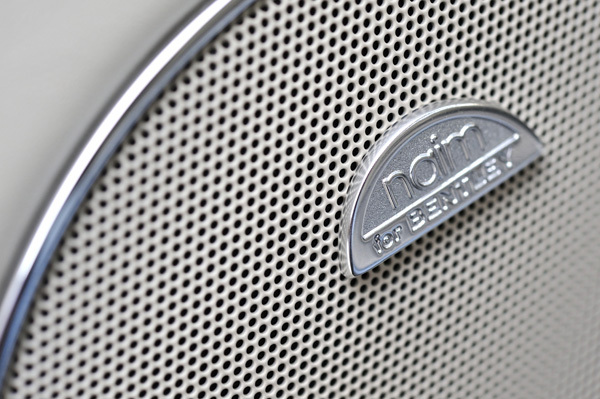 But the Naim for Bentley system is the one widely acknowledged as the best in the business, so I accepted the opportunity to have another listen, not to mention woofle around for a week in the car – although Bentley did provide a ‘mains adapter’ kit, so I could have done the entire review on my driveway had I chosen so to do. Which of course I didn’t. So yes, even the Naim for Bentley system can be used with an offboard power supply. Over the course of about 600 miles of motoring, for which I am sure my Nectar points balance will reward me later – the Spur’s W12 5998cc engine means fuel consumption of 20mpg if you’re very lucky! – I’ve had the chance to try the Naim for Bentley system in town, on motorways and on horribly thumpy and potholed A-roads, listened from the driver’s seat and in the rear of the car, and also chauffeured my wife around while she sat in the rear, played some of her favourite music and offered her opinion. 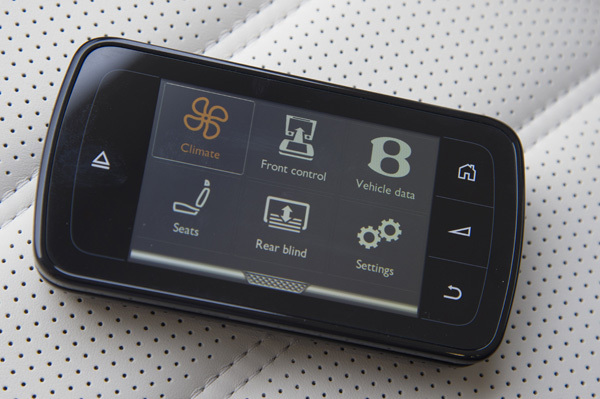 Rear seat infotaiment option includes screens, DVD/CD players and HDMI/USB inputs, plus wireless headphones. Oh, and laptop/picnic tables! 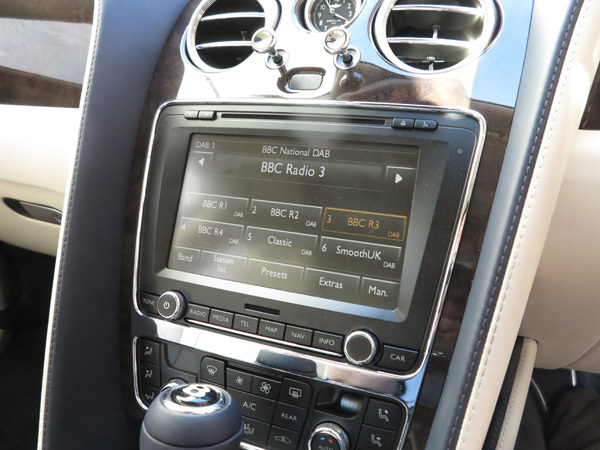 The car itself has a six-disc CD changer in the glove compartment, CD and SD card slots in the main ‘infotainment’ unit, and an input for an iPod also in the glove box, while a £5475 rear seat entertainment and connectivity package brings separate iPod, USB HDMI and DVD/CD playback devices for each rear seat, connected to wireless headphones and large displays on the back of the front seats, not to mention an onboard Wi-Fi hotspot. 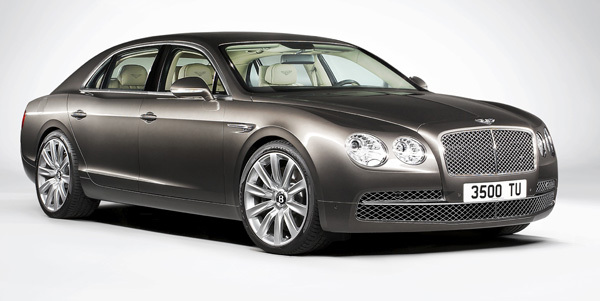 The standard entertainment system includes an eight-channel, eight-speaker audio set-up using Balanced Mode Radiator drive units, but the Naim for Bentley Premium Audio package, a £5610 upgrade, gives the car 13 channels of amplification totalling 1100W, eight enhanced DSP modes including a ‘Naim Audiophile’ setting, 11 Naim-designed speakers including a pair of substantial subwoofers, dynamic equalisation, speed-dependent volume control, and a ‘theatre surround’ system. 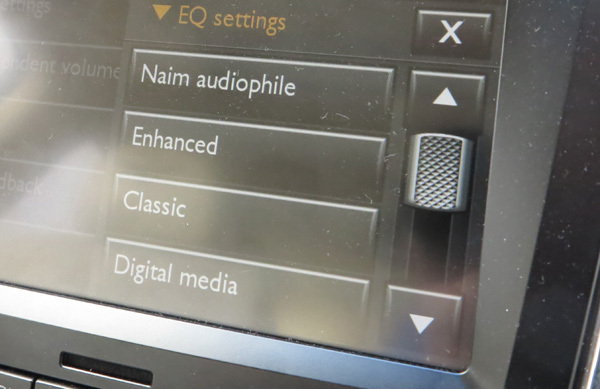 On the vehicle I drove, the Naim system was just one part of an enormous list of options fitted, bringing the £140,900 base price up to a total of £185,180, but then press demonstrator cars do tend to come with every single option fitted. Once the initial nervousness of driving something so valuable (and so huge) was overcome, and I’d discovered that for all the power available – (the Flying Spur will accelerate from rest to 60mph in 4.4sec and apparently go on to a 200mph top speed) – the vehicle is very docile either in traffic or travelling gently on main roads, I found I was able to give some attention to the audio system. Well, I could once I had some music loaded: I was disappointed not to find a standard USB input in the front, and that the potentially very useful SD card slot was only compatible with mp3 or WMA files, meaning that I had to resort to CDs loaded into the glovebox changer, or an iPod connected via the cable also hardwired in, loaded with a wide variety of music in CD-quality WAV format. Bluetooth connectivity is also available for suitable smartphones and tablets. There’s no denying that the Naim for Bentley system sounds spectacular, with the kind of performance most enthusiasts would be more than delighted with in a home system, let alone a car. Of course, the near-silence of the car environment plays a major part here, although installations designed for the Bentley’s convertible models do have software to compensate not only for the change of acoustic when the roof is lowered but also the greater noise when driving ‘top down’. 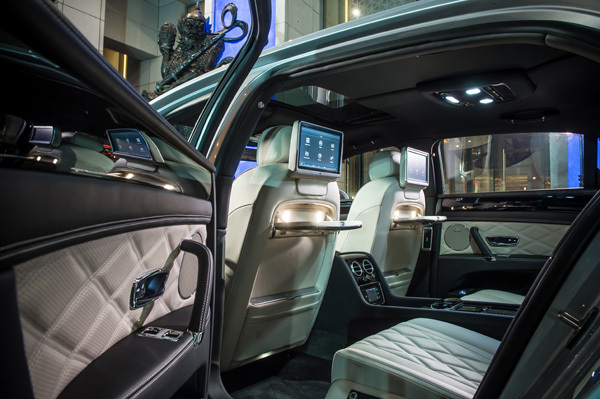 In the Flying Spur, even when one accelerates hard – only up to 70mph, of course – the engine is only audible as a very distant roar, and becomes silent again at cruising speed, making this a good environment in which an audio system can show its stuff. The disappointments of the system are all on the operational level: the front end of the system is beginning to show its age in the lack of support for formats beyond mp3 and CD – I’d like to see FLAC support in there, for example, along with handling of higher-resolution files –, and in the lack of access to track-skip or even album-skip via the steering-wheel controls, which only offer volume up/down. The display in front of the driver can be set to display track information – though I have to admit most of the time I kept it showing a big digital speed readout! 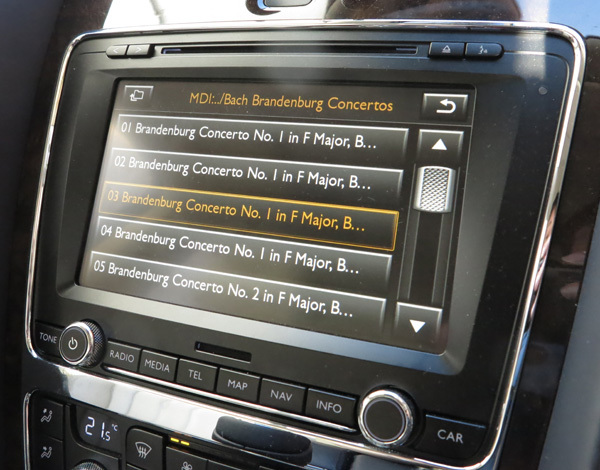 – but having to reach down to the main touchscreen to change tracks or album was slightly distracting, especially in a vehicle with so much performance potential. And that’s especially so since the ‘front end’ of this system seems a bit slow and lazy: touch a virtual button and you have to wait a moment or two before the change is implemented. It’s not a huge delay, but it’s enough to have you glancing back down again to make sure something is actually happening; my usual drive has a similar, but smaller touchscreen interface but a) it’s mounted much higher and b) its reactions are markedly faster. 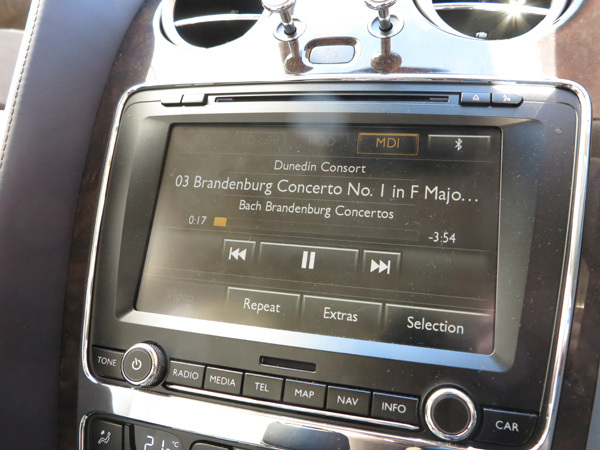 But the Naim tuning – and especially that ‘audiophile’ mode – is still a revelation: the sheer power and dynamic ability, whether delivering the full force of orchestral music or simply delivering piano and violin with crispness and amazing detail, remains the benchmark for others in-car. 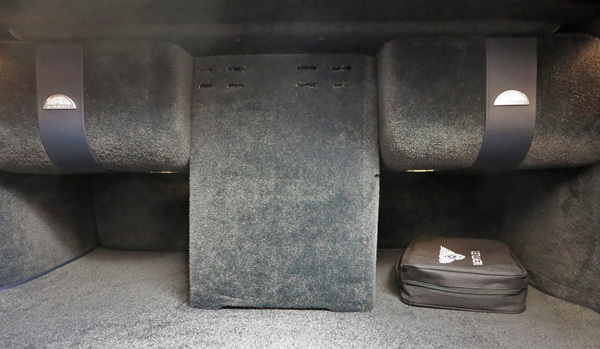 What’s more the scale and drama available from the heft of the amplification and the subwoofers – never have I heard a car with bass so forceful and yet so well-defined – is frankly amazing, and combines well with the way those BMR drivers deliver pin-point imaging without ever drawing attention to the location of the speakers. Turn off the ‘Naim Audiophile’ EQ and no, the sound doesn’t collapse into a mushy mess – after all, the Naim amplification and speakers are still doing their thing –, but it does become somewhat looser and less detailed. There’s less sense of the sound emanating from somewhere just in front of the windscreen: rather it just fills the cabin in a manner that’s entirely pleasant, but not quite as magical. In other words, without the equalisation, the sound of this car, whether playing accompanied voice, chamber ensembles or orchestral music, is still way above the kind of experience you’re likely to enjoy even with a well-sorted system in a lesser vehicle. However, switch in the audiophile mode, and (to use an old audio cliché) everything just snaps into focus, becoming both easier to enjoy due to the greater clarity and hugely more entertaining. Oh, and it’s easier to hold a conversation even with the system pretty loud when the Naim equalisation on, though I am sure the Naim engineers would really rather you listened to the music. Yes, you can still hooligan it! With an eye to the old ‘footballers and their Bentleys’ stereotype – do they still buy Continental GTs, or have they moved on? – one can still ‘hooligan’ the system even with the Naim audiophile mode switched in, and indeed the system will go very loud, all the way up to the kind of levels much coveted for the kind of dance music listened to by young people today. Or Wagner. However, it does so while remaining entirely clean and with all the detail and subtleties of the music intact, right the way up to levels way beyond ‘exciting’ and well into ‘just plain silly’ territory. 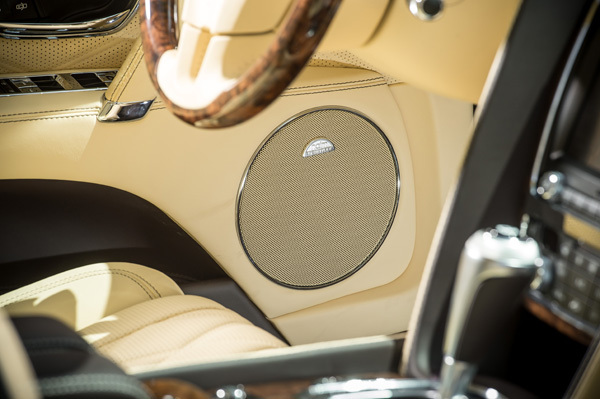 The Naim for Bentley Premium Audio System remains a standard-setter for car audio, and is equally impressive whether pootling along a country lane with some Chopin tinkling in the background, or powering out everything from Bruce Springsteen to Beethoven symphonies. The front end of the set-up may have some catching up to do in its capabilities and operation, but the sound on offer is still quite remarkable.